My weblog and ramblings on Technology,Payments, Digital Banking,Innovation,New Media, Entrepreneurship and.. 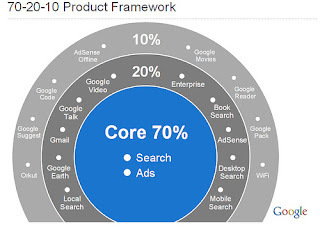 According to CEO Eric Schmidt, 70 percent of their resources are channeled to the core business of internet search and advertising, and 20 percent is channeled to adjacent products such as desktop and product search services. The remaining 10 percent is focused on highly experimental products - innovations important for the long term. Liisa Välikangas, Managing Director of the Woodside Institute, wrote an interesting piece called The golden spur: Innovation independence. In it, she reveals some surprising facts about the importance of personal independence in the innovation process. For instance Google's independence formula is particularly revealing: the company has a management philosophy that requires it to dedicate 10% of its investment to employee- initiated projects unrelated to the core business. It is observed that the importance of efficiency and reliability in business has stifled our freedom to explore new things. The author argues that the “freedom to explore” factor is essential to innovation. And innovation is essential to sustained competitiveness. Today's leadership challenge is learning to manage the independent thinkers who refuse the constraints of professionalism and instead innovate on their own terms – in other words, as amateurs. This freedom is facilitated by communications technologies that enable individuals to participate increasingly on their own terms. Companies need to unleash their human talent and raise their level of innovation so that they can compete globally. To accomplish this, managers must respect their employees' independence – the very source of innovation. Liisa further states that the case for innovation is the case for the labor of love, that is, the work of passionate amateurs. can u detailed it what this formula is all about ? i mean what u have told is what they do...but i am curious to knw as to How do they implement it ? Financial Services professional with a passion for Innovation and Technology. I am, by nature, curious. I ask a lot of questions and enjoy meeting people from outside my intellectual world. My Mantra~Fail forward, Learn Fast, Be bold, Focus on Impact, and Live Life.